Q. What is the Delaware Boating Safety Education Certificate? A. The Delaware Boating Safety Education Certificate (also known as the Delaware boating license or boaters license) is proof that you have met the mandatory boat safety education requirements for the State of Delaware. The Delaware Boating Safety Education Certificate is good for life and does not need to be renewed. Q. Boating License or Boating Safety Education Certificate... is there a difference? A.The boater education card is proof that you have successfully completed a boating safety course. The boater education card does not expire and does not need to be renewed. Therefore, it is NOT a Delaware Boating License! Q. I do not have a driver's license. Can I still get the Boating Safety Education Certificate? Q. How can I get my Delaware Boating Safety Certificate? Q. Who needs a Delaware Boating License? A.A Delaware Boating Safety Education Certificate (also referred to as the Delaware Boating License) is required onboard for all boaters born after January 1, 1978 when the vessel is underway to satisfy the Delaware boating regulations. For more information please consult the Delaware boating laws and regulations page. Q.What do I need to pass the boating license? A. You need a grade of 80% or higher on the boating license to pass. That means 48 correct answers out of 60. Q. 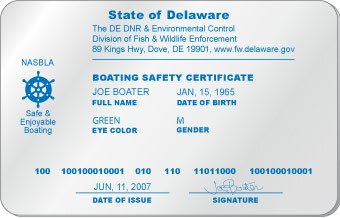 Is anyone exempt from obtaining the Delaware Boater License? A. Yes, there are certain exemptions from the boat safety education requirement. For more information, check out the Delaware Boating Laws page.